A derby hat is a style of dress for women to wear to formal events such as churches, weddings, Kentucky derbies, ascot races, and cocktail parties, to name just a few. It is a strong statement to your outlook in most of the cases. If you want a headwear with an elegant and outstanding look, this is the hat to go. With its gorgeous look and design, it can be tricky to find a suitable derby hat and wear it properly. 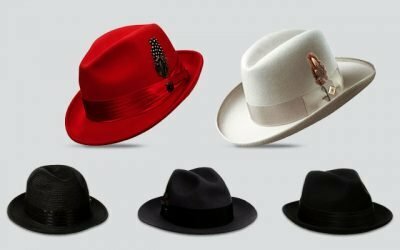 In case you already have a nice derby hat, you might want to check this article here for tips on wearing a derby hat. 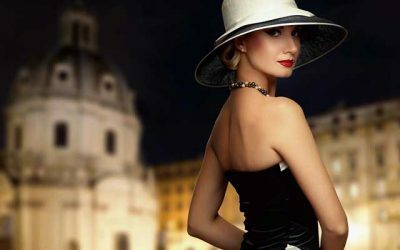 On the other hand, if you are still on the search for the best derby hat to wear to a formal event, check out our pick for the best derby hats for women that you can find on the market here. Make sure you pay attention to the design, the material, as well as the size so that you can pick up the most suitable derby hat to purchase. 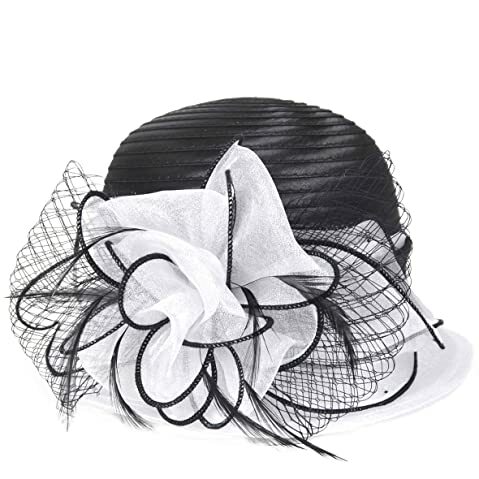 Its Main Features: This derby hat is made of 100 % of polyester for the organza material. There are several options of colors for you to choose from including pink, brown, beige, and gold. The brim of the hat is 4 inches in width. This hat is available in 1 size that can fit head’s circumferences from 21 inches to 23 inches. First of all, this hat is made with an excellent craftsmanship for an elegant and beautiful look. It features a double layer design which is translucent so that the hat would not cover your beauty. The construction of the hat is firm and solid while the details are stitched nicely and securely on the hat. Second of all, this hat, like most of the women’s derby hats that you can find on the market, is made of polyester. Still, the material is of the premium quality which is lightweight and breathable. Moreover, the fabric of this hat is soft enough for you to easily fold it and pack it into a small bag. You can save a lot of space carrying the hat with you when you go travelling. When you take the hat out, it will spring back to its original form. The brim of the hat is 4 inches in width, which would be enough to protect a large area of your face as well as your ears and your neck. Not to mention that the brim of the hat is reinforced so that it would not become flimsy and block your view when there is wind coming against you. You can’t reshape the brim though. It would stay in its shape regardless of how long you have been wearing the hat. 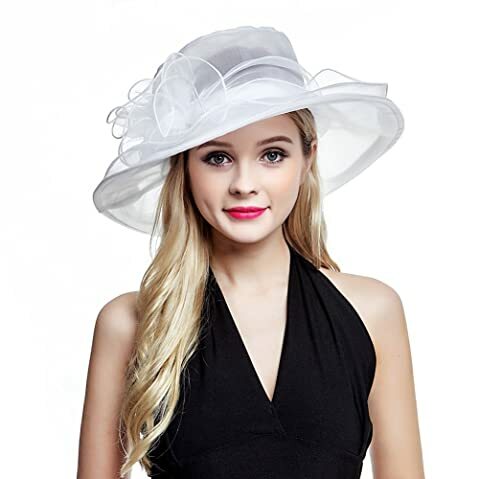 Its Main Features: This derby hat is made of 100 % of organza and polyester material featuring the gauze style with double layers. It is available in 1 size that can fit head circumferences from 22 to 22.6 inches. The width of the brim is 5.1 inches. There are more than 30 choices of colors for your consideration. The most significant feature of this hat is its wide brim. The brim of the hat is wide enough for you to cove a large area of your face as well as your ears and your neck. Moreover, while this hat features 2 layers of organza and gauze, it does look solid without being too stiff. Thanks to the high quality gauze, this hat is solidly made for a firm and durable construction. The polyester material is also of premium quality so that it is lightweight and well ventilated. If you are looking for kentucky derby hats to wear in a hot summer day, this hat is worth considering. While this hat is available in 1 size, it comes with an inner adjustable drawstring for you to easily adjust the hat for a better fit. 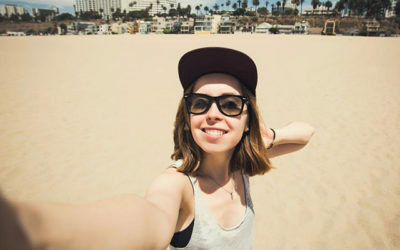 However, this hat only fit a small range of head’s circumferences so make sure you measure your head right to determine whether this hat is a good fit for you or not. Last but not least, with more than 30 choices of colors for you to choose from, you will be able to find a derby hat in this line that meet your requirements in colors and styles. You can also choose from several choices of decorations such as floral items, diamond casings, stones, and feathers. 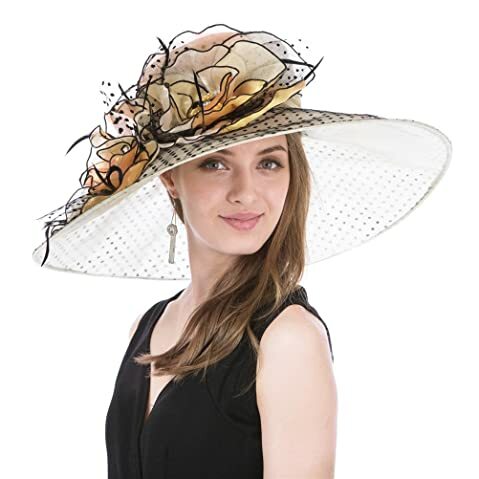 Its Main Features: This derby hat for women is made of 100 % of mesh and nylon material. It features a traditional design with floral feather, hair clip, and headband as decoration. There are 10 options of colors for you to choose from including black, red, purple, white, and navy blue. This hat is available in 1 size that can fit head’s circumferences from 21 to 23 inches. This Kentucky hat is made of the high quality nylon material for the hat to be lightweight and comfortable to wear, especially when you have to wear it for a long time. In addition, it features the mesh material so that the hat can be well ventilated. Along with the breathable hatband, the hat will be able to keep your head cool and dry all of the time. This hat features a hair clip and an adjustable hatband for the hat to stay more secured on your head. These items are removable so that you can choose to wear the hat with these items or not, depending on your preferences. The details on the hat are nicely stitched to the hat so that you don’t have to worry the feathers would fall off. 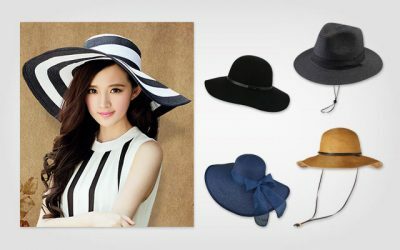 In case you are looking for derby hats for women with an elegant vintage British style, check out this hat. There are 10 options of colors for you to choose from to match with the dress of your choice. These colors are all bright and vivid. The fabric is fade resistant so that the hat can retain its color well after a long time. 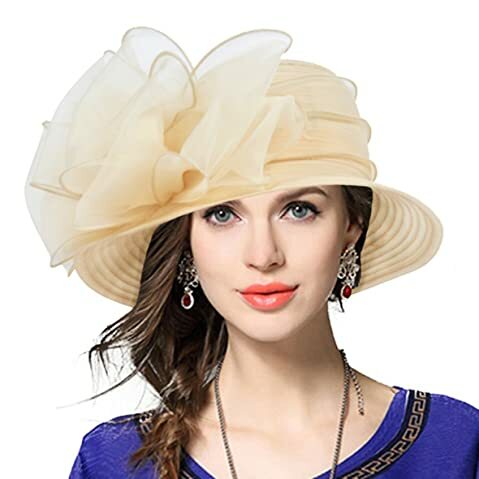 Its Main Features: This church hat for women is made of 100 % of polyester organza. It features the style of a wide brim hat with floral details. This hat is available in more than 20 choices of colors such as red, blue, pink, yellow, to name just a few. It comes in 1 size that can fit head’s circumferences from 21 to 23 inches. Thanks to the premium quality material, this hat is lightweight and comfortable to wear, regardless of the glamorous floral details attached to the hat. The brim is very sturdy and solid, which can stand well and would not become flimsy when there is a breeze coming at your face. 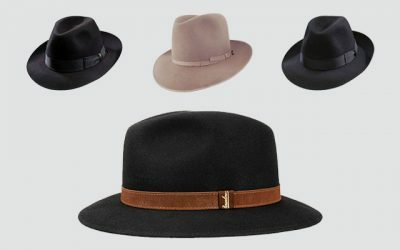 And although the brim is quite sturdy, you can shape it to the shape that you like so that you can wear with different styles to different occasions. Another thing that I love about this hat is that it comes with many choices of colors. Not to mention that these colors are all so bright and gorgeous, which are also fade resistant, so that the hat can look as shiny as new for a long time. You can easily wash this hat with a wet cloth as well. 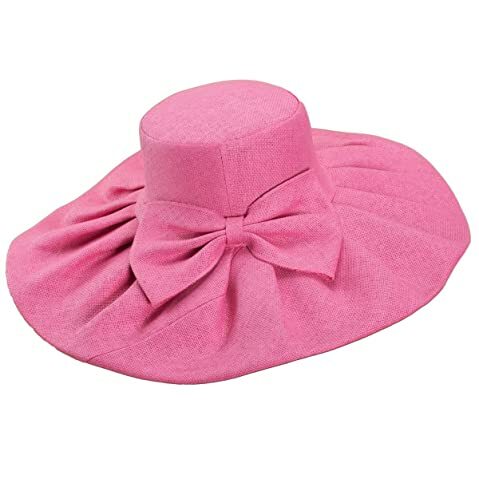 Like other high quality church hats for women, this hat is available in 1 size but it comes with an internal drawstring for you to easily adjust the hat for your customized fit. Last but not least, this hat is made with a great attention to details as it has a great finishing with no loose threads. The construction of the hat is firm and solid. Also, you would not be able to spot any hard glue on the hat at all. 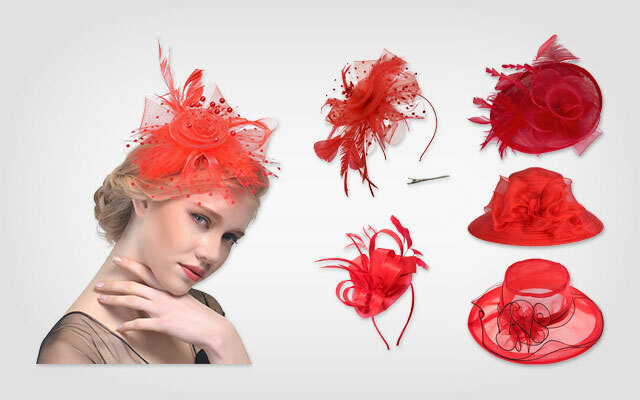 Its Main Features: This derby hat for women is made of 100 % of polyester organza. It features various choices of colors for you to choose from including black, pink, yellow and purple. It comes with a wide brim of 4 inches and floral detail on top of the hat. This is among the church lady hats which are available in 1 size that can fit head’s circumferences from 21.26 inches to 22.83 inches. This hat comes with a wide brim which is 4 inches in width. Thanks to the wide brim, a large area of your face as well as your ears and your neck are protected against the harsh sun rays. The double layers of the hat are also effective in preventing the harmful elements of the harsh sun rays to get into your eyes. The brim is also quite firm and solid, which helps the hat to stay in its shape. Also, it will not become flimsy in case of a high wind. The construction of the hat, besides the brim, is also well made for a firm and solid body. All of the parts of this derby hat are double stitched for extra durability. You would not be able to see any loose threads. The details are also attached firmly and securely on the hat so that the nice floral details can stay their place regardless of how many times you wear the hat. Last but not least, this hat is made with the premium quality material. The fabric is fade resistant so that you can easily wash the hat with a wet cloth without worrying that the hat would be stained. Also, the hat is lightweight, breathable and comfortable for you to wear, even in the hottest days. If you are looking for a white derby hat, this hat comes in several shades of white with different choices of accents for you to choose from. Also, this derby hat can make a strong statement with its gorgeous brim. The brim of the hat is 4 inches wide and it is able to prevent glares and snow from getting into your eyes. 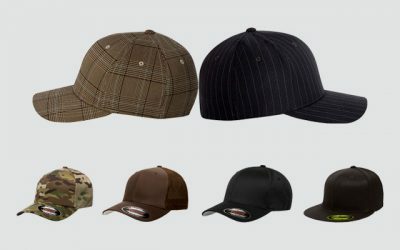 Moreover, this hat is made of the premium quality material which is lightweight and well ventilated. Thanks to the high quality material, this hat will make you feel comfortable wearing the hat for a long time, even in the hottest summer days. Its Main Features: There are 10 options of colors for you to choose from including red, yellow, blue, and beige. 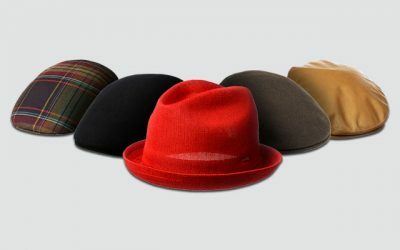 The design of the hat comes with irregular folds trimmed around the hat. This hat is available in 1 size which can fit head’s circumferences from 22 to 23 inches. 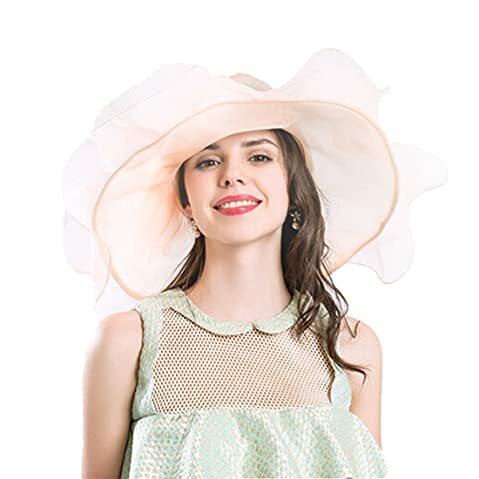 In case you are looking for kentucky derby hats for women which are made from different materials rather than the polyester, organza, or nylon, check out this hat. It is made of the premium linen material which is the softest and most comfortable material. Thanks to the soft material, you can easily fold the hat and pack it into a small bag for easy storage and carrying around. When you take the hat out, it will bounce back quickly to its original form. The material is breathable and makes the hat quite lightweight. Also, the fabric of the hat is capable of wicking moisture away and retaining the heat around the hat. Therefore, this hat is suitable to wear all year around. One of the most outstanding features of this derby hat is that it comes with a super wide brim. The brim of this hat is 5.7 inches, which is way wider than other brims of other derby hats that you can find on the market. The brim of the hat is quite stiff so that it will not become flimsy in case it is windy. But when there is a high wind coming, the brim of the hat can become super floppy and block your view. This hat is also quite big, which will surely make you more outstanding. However, if you have a small build or a small face, this hat can be too much. 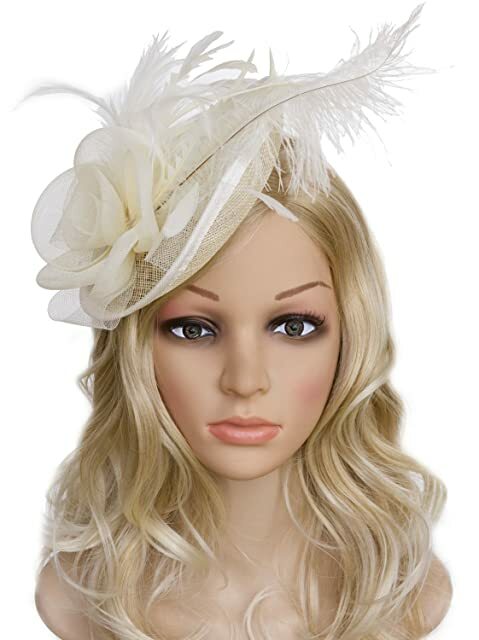 Its Main Features: This hat is made of 100 % of satin with feather details. It comes with a headband and a hair clip. There are several options of colors for you to choose from including stain, red, black, and blue. It is available in 1 size that can fit head’s circumference from 21 inches to 22 inches. With the high quality material, this hat looks substantial and vibrant. The double bow knots with petals and the swing feather make the hat look classy and beautiful. All of the colors of the hats are also quite sharp and vibrant. For instance, if you are looking for a rich black derby hat, you would be able to find one here. Besides the feather details that add to the elegancy of the hat, it also comes with a headband and a hair clip, making the hat not only stylish but also functional and comfortable to wear. The hairclip keeps the hat secured on your head regardless of how windy it is outside. This hat is available in 1 size. However, it features an inner drawstring which makes the hat more adjustable and comfortable to wear. In case you are searching for a unique derby hatband with a classy and beautiful deign, check out this hatband. With its simple yet bold design, it can go well with both of your vintage dresses and your modern clothes. Also, the hatband is more compact in size than the traditional derby hat. So if you don’t want to have a really big hat, you should check out this option. 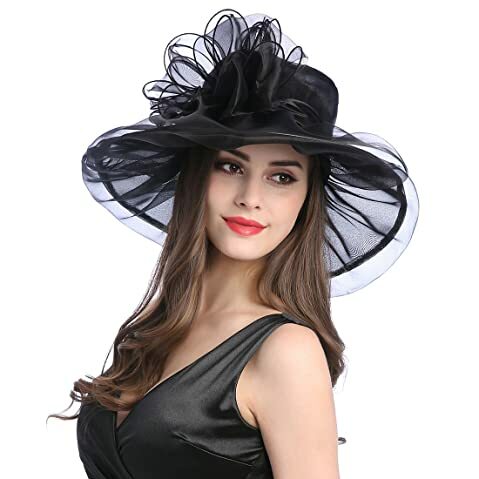 Its Main Features: This derby hat for women is made of 100 % of polyester with its birdcage veiling and flush amount of boa feather. It is available in 1 size that can fit head’s circumferences from 21 to 23 inches. There are more than 10 options of colors including the vibrant red and yellow, to the solid black and dark navy. One thing that I love most about the hat is how it sways in the wind. It is designed with its birdcage veiling and plenty of boa feathers that cascade the back. 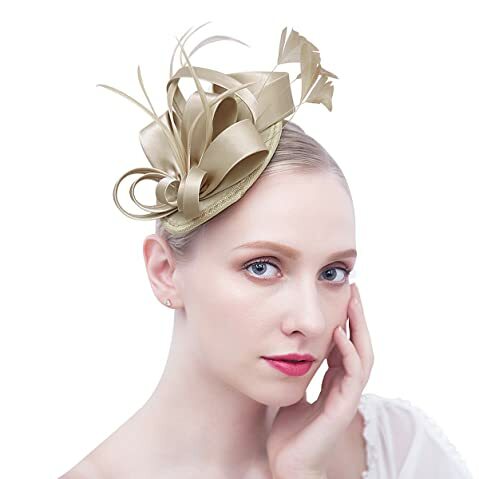 The bouncy mesh ribbon and flighty feathers make the hat look even more glamorous and feminine. All of the details are firmly and securely made with a headband a clip to hold everything in place. The hairclip of this hat also makes it easier for you to wear this hatband in any way that you like. 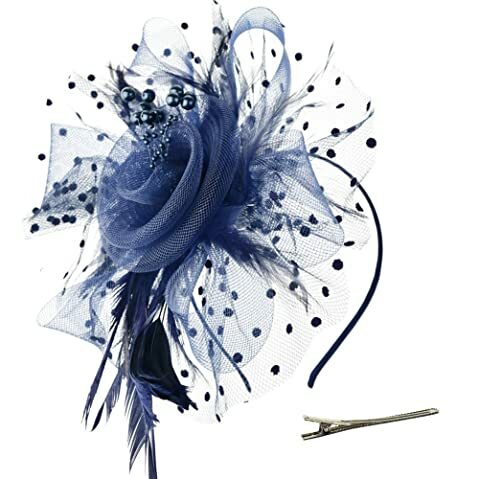 You can choose either to wear this derby hat with a hair clip or with the headband. For instance, you can style your hair like a bun and wear with this hairclip. Or you wear it further towards your face as a vintage styled flower fascinator. 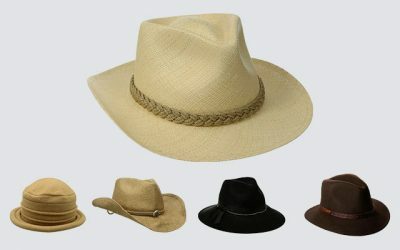 Besides the unique and stylish look as well as the solid construction, this hat is made with high quality materials. The premium materials make the hat look expensive. Also, they are tough and durable. And while there are quite a few details on the hat, the hat is still lightweight and comfortable to wear, even when you have to wear it for a long time when you attend an event. Its Main Features: This lady derby hat is made of 100 % of polyester. It features the design of a traditional Kentucky derby hat with a translucent brim. This hat is available in 1 size which can fit head’s circumferences from 21.3 inches to 22.8 inches. There are more than 30 options of colors for you to choose from- from sky blue, to light pink, and apricot, to name just a few. The width of the brim is 3.14 inches while the height of the crown is 4 inches. Besides the high quality polyester material which makes the hat lightweight and comfortable, the hat also comes with an inner sweatband made from cotton. This sweatband is capable of wicking moisture away and keeping your head cool all of the time. Furthermore, the sweatband is super stretchy, which can work as an inner drawstring so that you can easily have a more comfortable and customized fit. Another prominent feature of this hat is that there are so many choices of colors for you to choose from to match with the clothes of your choice. These colors are sharp and vivid, which will surely enhance your fashion statement on an important occasion. 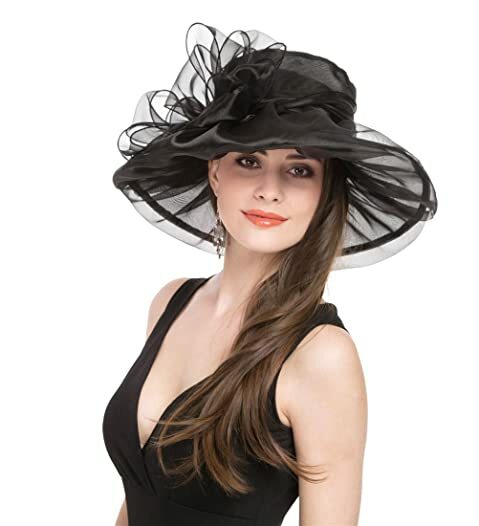 Its Main Features: This derby hat for women is made of 100 % of satin with polyester Encryption yam. You can choose among several options of colors such as white, blue and green. This hat is available in 1 size that can fit head’s circumferences from 21.3 inches to 22.8 inches. Like other high quality derby hats for women that you can find on the market, this hat is made of the premium quality. The hat is super soft and smooth to the touch. In addition, it is quite lightweight and breathable, even in a hot summer day. Along with the well ventilated fabric, this derby hat comes with an inner sweatband to prevent your forehead from rubbing against the hat and enhance your comfort. The sweatband is also adjustable for you to have a better fit with this hat. And you can expect the construction of the hat to be very firm and solid. The floral detail is attached firmly and securely on the hat using the glue. Other details, including the brim of the hat are reinforced with double stitching lines for extra durability. Make sure to dry clean this hat only. You can only remove dirt using the tape or the soft bristle brush. When creases and wrinkles appear on the hat, you can steam iron the hat to make sure it becomes flat again. 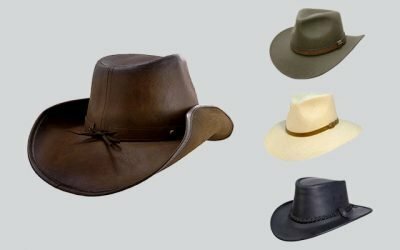 The fabric of the hat is quite thick and fade resistant so that it can retain its shape and color after you wear the hat a long time, definitely a worthy long-term investment. These fancy derby hats for women are some of the best derby hats that you can find on the market. As you can see, they are made of different materials with different designs, constructions, and colors. They also have different prominent features for you to choose from as well such as hair clips or head bands. We hope that with the review above, you can quickly find the derby hat that meets your needs and requirements in styles and qualities. As long as you spend your time and effort searching for a suitable derby hat, you would be able to find a hat that does not only enhance your style and ensure you feel comfortable, but also make you outstanding from the crowd.